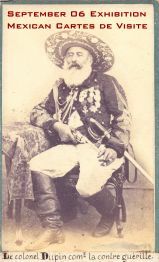 94 albumen "cartes de visite" photographs depicting Maximilian, Carlota, their court, and military personnel during the European intervention in Mexico, 1862 - 1867. Start Photos include portraits of the rulers, army officers and soldiers, and portraits of court members. Other photos show leading persons and republican leaders opposing Maximilian. There are also portraits of "Tipos Populares", (street retailers, workers or common people) including a woman and children making tortillas with a banner of the Virgin of Guadalupe in the background. Another shows the Kickapoo Indian delegation to Maximilian's court. There is also a small number of images of Mexico City and Chapultepec Castle. The name of photographers, Francois Aubert, Merille, Julio Michaud and Pestel appear on the photo mounts. Most of the Merille albumen are mounted on Julio Amiel cards. Provenance: South of France, from family of an army officer.